Mother Teresa is about to become the focus of a new film, one that has some pretty powerful Hollywood starpower behind it. Kier Pearson, the screenwriter behind Hotel Rwanda has just joined the project, which at this point also includes NBC's Dracula producer Tony Krantz. 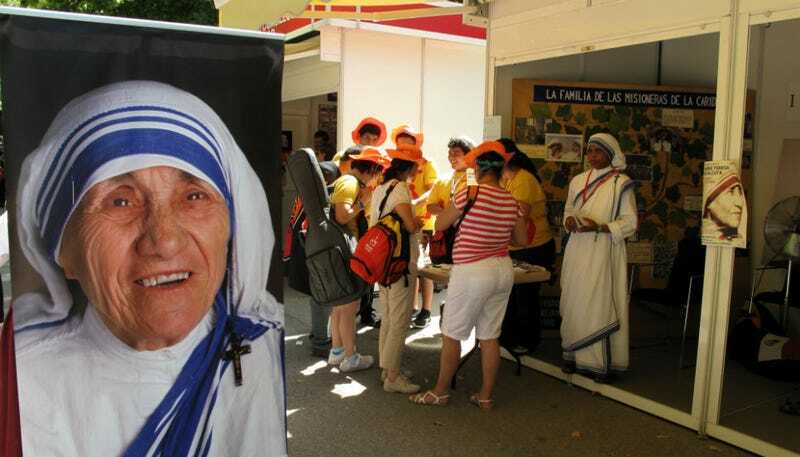 The story will focus on Mother Teresa's work in Calcutta during the 1950s when she founded the Missionaries of Charity after hearing a call from the Lord to begin ministering to the poorest of India's poor. She won the Nobel Peace Prize in 1979 and by the time of her death in 1997, the order had grown to more than 4,000 sisters running orphanages, hospices and charity centers. "Keir's presentation and his Oscar nominated script of 'Hotel Rwanda' and his sensitive script for 'Chavez' (the story of Cesar Chavez to be released this year) made him the perfect choice," Krantz said. "'I Thirst' is the first and only authorized film about the life of Mother Teresa on the big screen. We couldn't be more excited for this movie about a woman who stood for total commitment, faith, charity and love." Tentatively titled I Thirst, Krantz said the film, made in collaboration with the Mother Teresa CentreMother Teresa Centre, will not be a religious movie. "This is not going to be a movie about Catholicism. It's going to focus on her deeds," he said.